This is a really easy recipe that doesn't require the mixer. The recipe comes from Smitten Kitchen; I made a few changes, including adding hazelnuts to my batch (one log or about 15 cookies; half the original recipe), skipping the egg white glaze as well as the cinnamon-sugar coating. It's just a mix of wet and dry ingredients and you end up with a somewhat sticky dough that you press out into a log about 2 1/2 inches wide. Bake the log for about 25 minutes (the kitchen is going to smell great! ), then take it out of the oven to cool slightly for about 15-20 minutes. Then, it's time to slice the log and get the biscotti into the oven for the second bake. During the second bake, the biscotti firm up further and turn nice and golden brown. Ready to go. Allow them to cool and dip them in some melted chocolate...I highly recommend it. Once fully cooled, you can store the biscotti in an airtight container for ages. It's such a great standby cookie! Heat oven to 350 degrees. Line a baking sheet with parchment paper or a silicon baking mat. In a bowl, sift together the flour, baking powder, cinnamon, ginger, cloves, black pepper, and salt. In another bowl, whisk together the sugars, melted butter, egg, and vanilla. Add wet ingredients, together with the nuts, into the dry ingredients. Stir together with a sturdy rubber spatula until combined and you end up with a soft, sticky dough. With lightly floured hands, transfer dough onto the prepared baking sheet and shape it into a slightly flattened log about 11 inches long and 2 1/2 inches wide. Bake until browned, about 25 minutes. Remove baking sheet from the oven, let cool on a wire rack for 15-20 minutes. Carefully transfer the warm log to a cutting board. With a serrated knife, use a sawing moment and cut on a diagonally into 1/2 inch thick slices. Place, cut side down, back onto the baking sheet. Bake for 10-12 minutes, until golden underneath, then flip biscotti to the other side and bake for another 6-8 minutes until golden brown and firm all over. Let cool on wire rack. You can melt some chocolate and dip the biscotti about halfway; allow to sit on parchment or wax paper until chocolate sets. Once fully cooled, you can store biscotti in an airtight container for weeks. I bet they smell and taste divinely! Yes - first it was that divine aroma and then you really taste it in the biscotti. : ) Happy holidays! 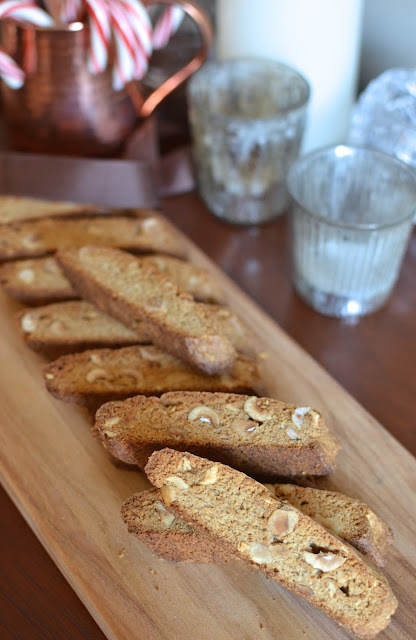 I've never made biscotti before but I would love to find some time; love the hazelnuts in this. I love having a biscotti as a nibble or treat. The hazelnuts add such a great richness (and goes so well with the chocolate)! Don't you just LOVE biscotti? Coffee or tea and a crunchy cookie will cure anything :) These are really lovely and I adore Gingerbread anything. Have a wonderful week! I really, really do. Thanks, Tricia. Love this Italian classic! These are extremely delicious with all the warm winter spices and hazelnuts. I think so, too. Thank you. Hi Monica, these look divine, all my favorite flavors and smells this time of year. Love that you dipped them in chocolate. Happy Holidays!!! Ginger and spices! They surely smell good and the biscotti looks delcious!! Thanks, Bal. I loved the smell and taste of this batch. I wish it was my son's but he's not heavily into gingerbread or biscotti though he did have a gingerbread men cookie phase. : ) These did smell wonderful. Love all your holiday cookies! What a coincidence, Monica. I also made Gingerbread biscotti last week and my next post is Gingerbread biscotti, but yours look way more delicious than mine. A hot cup of tea and these biscotti would make a great brunch. Would love to give this is a go when my baked batch is finished. I am sure yours are every bite as good and better! No doubt I'd love to swap gingerbread biscotti with you! Yeah, those rich hazelnuts really boost them but the gingerbread flavors still come through loud and clear. Your grandma might enjoy these! : ) Happy baking! Such a lovely treat! Yes, I do smell the spices from here and the hazelnuts are the perfect addition...makes them look stunning! Thanks so much, Sonali. It is a nice treat to have on standby for the holidays. Wish I had some right now. Mmm I love the gingerbread and hazelnut together! Lovely!! Monica I have been wanting to make biscotti for such a longtime and today looking at this, I totally feel motivated to give these a try!! Love the flavors!! You make super fancy breads so this would be a walk in the park. Enjoy the weekend, Juliana. Half the original recipe sounds great and I really like the changes…they fit my tastes perfectly. Just pinned, thank you! Thank you, Karen! Happy holidays! I am a huge fan of crunchy hazelnuts. I know these would be a favorite at our home, especially if you dipped your biscotti in dark chocolate. Thanks, Bobbi. Biscotti is definitely handy to have around.